When looking for a professional concrete coating company for stained concrete or sealed concrete flooring in Gilbert, look no further than Barefoot Surfaces. Barefoot Surfaces is a licensed contractor with over 20 years of experience servicing Gilbert and the surrounding areas. With concrete flooring, you can update your interior and exterior floors for a beautiful new look. We can update kitchens, bathrooms or your entire interior. We do exterior flooring such as outdoor patios and pool decks. If your home’s flooring is out of date, worn or just needs to be replaced, concrete flooring is the perfect flooring option because it gives you a more modern look for an economical cost. In Gilbert there are many homes ranging in age from brand new to very old. These varied styles and ages can lead to some interesting problems for the garage floors. Many times the concrete has been stained and marred by use, and these stains are almost impossible to remove with common household cleaning items. For this reason, many homeowners elect to have their floors ground, honed and stained. This creates a consistent coloring, and the protective coating which is applied after has the ability to protect and reduce damage to your stained concrete garage floor in the future. Barefoot Surfaces is a licensed and bonded company that provides concrete flooring services in Gilbert, AZ and the surrounding areas. The owner, Ric Ramirez and his team take great pride in their work. They are dedicated professionals that will provide the service you deserve to ensure you are happy with your finished concrete flooring. Don’t hire an inexperienced company. Barefoot Surfaces has over 20 years of experience. You can be sure they will be the trusted experts you need. Concrete flooring is an affordable option, call Barefoot Surfaces for an honest quote for your concrete flooring remodel. The huge benefit of having concrete flooring is how easy it is to care for. When cleaning concrete flooring, you can either vacuum, dry mop or use a traditional broom. After you’ve removed the dust, dirt and garbage from your floors, use a small amount of gentle cleaner mixed with warm water in a mop bucket. Ring out the mop so it is just damp and damp mop the entire floor. It is so simple to care for which makes it a very popular option inside your home in kitchens, bathrooms, hallways, living and dining areas. Some homeowners even choose to have their entire home interior updated with stained concrete. Contact us today to find out more about our Gilbert stained concrete services! 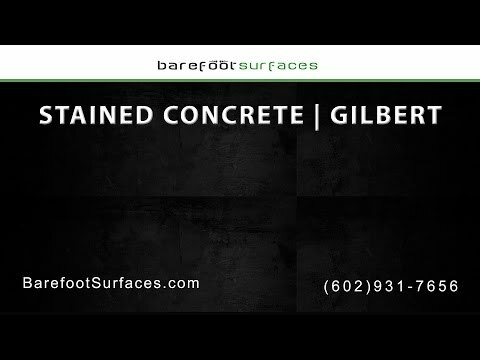 Call us today to discuss the many different options for your Gilbert concrete coating project. We have many different finishes and colors you can choose to stain your floors to achieve the look you want. Whether your home fashion is sophisticated, contemporary, traditional, Tuscan, Western or ultra-modern, our concrete flooring finishes will give your home’s interior and exterior the right look that is both smart and practical. Stamped, marbled, shiny, glossy, gray, brown, red, the choices are endless! Our Design Team can show you the past work we’ve done in other Gilbert homes and are happy to assist you with selecting the finishes that works best whatever your styling goals are for your home. We do more than just professional concrete coatings! If you are thinking about a garage remodel, call us! We can transform your garage into the man cave of your dreams! If your garage floors are just cement, an epoxy coating is just what you need for that instant WOW factor. Do-it-yourself garage epoxy kits are hard to apply and do not last. Instead, you are left with a peeling mess and money wasted. Allow us to come in and revamp your garage with a durable and most importantly professional grade of epoxy coating that will last a long time. We can also install Gilbert garage cabinets for ideal organization so you can get the most out of your garage space.